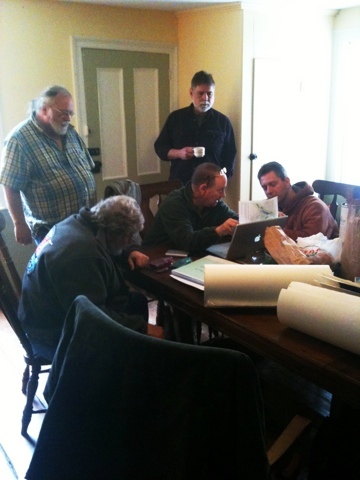 We just concluded hosting the second Tillman Crane Photo Retreat at Peters Valley Craft Center. It was a lot of different things, from talking about Zone System workings in the digital world & viewing prints from all the attendees to exploring around an photographing Peters Valley to comparing the virtues of several single malt Scotches. We shot primarily on Friday afternoon & Sunday morning due to the torrential rains on Saturday. The most asked about spot is the old motel down by Thunder Mountain. Since I had gone in there recently and checked it out I felt pretty confident having people working in it. The other popular spot was the Lenningtons barns. Shooting from a safe distance kept them safe and yielded some amazing images. Next years is scheduled for the weekend of April 15th, 2012. When a camera company can add a 64Gb solid state drive the size of a quarter to their cameras, what kind of sensor size will we be able to use? The image transfer time between the sensor processor and storage would be dramatically reduced and with a high speed external connection to your computer, such as SATA3 or USB3, not having a removable CF card would be an option for many users. because I haven’t written a blog entry about the iPhone, I feel I must…. I’ve realized I love it. I was talking with Laurie Klein, a marvelous photographer & teacher, about something totally different & I mentioned the iPhone. She reminded me about the best thing about it for the Photographer….. It’s always on…..when you press the CAMERA button a window opens & you see what the camera is seeing but since it’s a phone, it’s not in a normal position. As you move it into the position you need, the monitor shows you what you as passing through. It’s just not something you normally get to view. I’m sure It’s not just the iPhone that does this…..
Now what you think of digital photography……. Please try & play with a digital unit that does this…..
put some fun back into your Photography…. I took my IR modified old Canon G2 out in the snow to play yesterday & found snow to come out white rather than black. See even though snow is frozen water, read cold, it reflects light including IR. Just thought I’d mention it. and I haven’t written a thing in MONTHS. Funny, I’m still Photographing everyday. I got a comment from someone that, unfortunately, I took to heart and it took the wind out of my writing. It’s funny, I’ve received all sorts of comments concerning my photography. From glowing to flaming and everything in between and it’s never stopped me. I guess that means I have to photograph but not necessarily write.